In our open access computer center we give participants the resources needed to compete for meaningful jobs, and other economic opportunities in today’s high tech marketplace. The center facilitate’s their self-sufficiency for contributing to the community’s economic health. The 15 workstation in the Open Computer Center is open 5 days per week, and offers adults a way to research, and apply for competitive job opportunities, even if there is limited knowledge of technology. Under the guidance of 2 or more computer center monitors, our participants learn 21st Century job search skills, how to create resumes and cover letters, use the internet for researching current job listings, applying online for positions, networking using social media sites, text format for email, and learn the best ways to use email when looking for work. 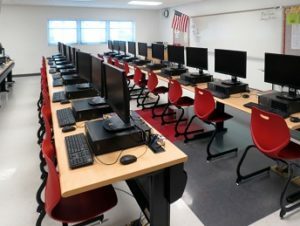 The goal of the Open Computer Center is to remove technological barriers, and increase computer access for those left out of the economic mainstream, or left behind educationally because of their lack of computer/technical and literacy skills.